In the spring of 2005, I was expecting a baby girl (little c) and a 40 foot high cube container of antiques from England and France. The few years preceding had been difficult for my extended family…there had been deaths, divorces, financial troubles and other trying personal issues. Lots of painful change. We had faced some hard times. Anxious to get the new inventory cleaned, displayed and sold before the baby arrived, I was counting down the days until the ship carrying my container docked in Norfolk, VA. The container would then make its way by truck to the shop. Everything would need to be unpacked, cleaned, inventoried, photographed, priced and sold. Post September 11, the import business had changed a lot but in almost 10 years we had never had any trouble getting our container through customs. Never say never. First the container was detained for X-ray inspection. Apparently my penchant for old garden and farm tools raised suspicions and so the container was completely unpacked for a physical inspection. I was physically unable to do heavy lifting so Michael drove to Virginia. He had been told on the phone that he could repack the container. 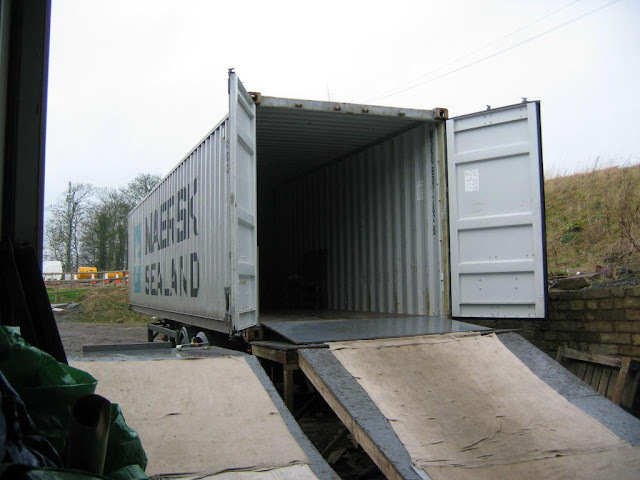 A container, well packed, is a thing of beauty…hastily packed, it’s a disaster. Michael drove home a week later, having never been allowed to even lay eyes on our container. Two weeks later it arrived and we held our breath. A birdbath…the basin cracked in two…a carton of blue and white porcelain plates shattered. The leg of a very fine 18th century buffet, snapped. The list went on. As we dug into the middle of the container I came upon a pile of what had once been lovely French earthenware jugs. I was excited that I had been able to source so many and had imagined how I would display them and how great they would look. They were shattered inside their shoddily replaced bubble wrap. At the end of the day, we realized it could have been worse. The furniture could be repaired, although it would be costly. I sat on the floor with the damaged plates and a hammer. I broke them into small pieces and displayed the broken bits in large glass canisters. Finally I sold the pieces to a woman wanting to learn mosaic work. Mike glued the birdbath together and brought it to our home…we didn’t think we could guarantee it well enough to feel right about selling it to someone else. The French jugs were a lost cause except for one that was broken across the middle. I sat it in an out of the way corner, by my work station, and left it there. One day, I was helping a client sketch ideas and plans for a small fountain. She had an old tub to for the base and was looking for something for the actual font. She decided on an urn…the water would bubble up from the center, cascade down the sides of the urn and back into the tub. It was going to be lovely. I had been threatening to add a water feature to our garden for years but I didn’t like the fountains I saw for sale at home improvement stores. I wandered the store looking for pieces to combine into a fountain. One of the biggest hurdles to designing a fountain is hiding the pump. I knew that my fountain would go under a dogwood tree so it needed to be low to the ground…not too tall. A low stone trough would be great but what to go with it? Maybe an urn like my client chose? No, the colors were too similar. An enamel body pitcher? No, it would rust out in a season and the scale was all wrong. Maybe an English watering can? No, just didn’t look right. Out of the corner of my eye, I noticed the two pieces of the broken French jug. I set the top in the trough. The angle of the break was just right…just right for a fountain! The dark brown color stood out against the putty colored stone. And best of all, because the bottom was missing (broken), the pump would be easily hidden. Voila! My perfect fountain. Most of the time, I am able to see the sacred in wholeness. But when something breaks, I try to fix it. And that’s ok…many things CAN be mended. In fact, in this disposable world we live in, more things SHOULD be mended. When things can’t be fixed or we won’t take the time or the trouble to try, we often dispose of them….send them off to the landfill where we don’t have to see them anymore. But there is sacredness in the broken things too…broken things, broken relationships, even broken people. It’s all sacred. When something breaks and cannot be fixed, we have an opportunity to re-vision it…give it a new purpose. Instead of banishing it from our sight, we can learn to live with the imperfection…the loss. We can sit and look at the broken things…learn to appreciate them fully…even come to love them… maybe even more than we did in their wholeness. As a whole, perfect thing, the French jug would have sat in my dining room…a lovely display. But in its brokenness, the jug directs cool water into a basin….the water makes music …robins bath in my fountain every morning! Children cannot resist dipping their hands into the stream. I am aware that the jug, in its brokenness, is much, much more fragile than when it was whole. When the weather turns cool, I do not take a chance. A cold snap would shatter it for sure. I store it more carefully than I do the other summer things. For one thing, how would I replace it? Where does one find a broken jug for sale? The jug, BECAUSE of its brokenness, is precious to me. In some ways, it is irreplaceable. I wonder how it would feel if we treated the broken and chipped places of our hearts with the same care? As a trainee to become a Spiritual Director, I am required to receive spiritual direction. I think that so far, most of what I have been learning is just that…to accept, love and cherish those things about me that are nicked…cracked….even shattered. When we search for the sacred, I hope we do not over look the broken things.